Card that has been doctored or is of questionable authenticity will receive a letter with a detailed explanation of the findings. 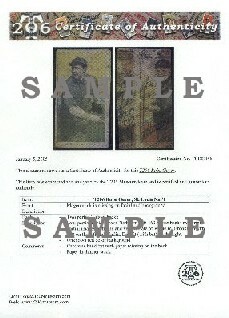 The letter includes high resolution scan of the card and summary on the characteristics on why it is not genuine. Full authentication fees are applied. If your card can not be authenticated, money will be refunded to you less any shipping charges. If you have any other question and couldn't found the answer on F A Q. Please contact coa@t206museum.com.